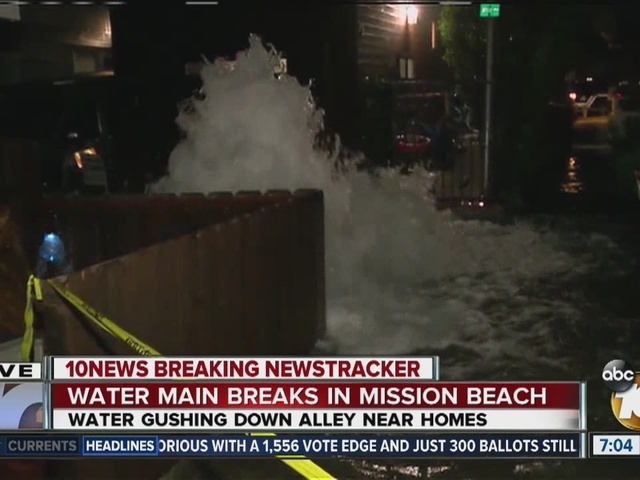 SAN DIEGO -- Repairs were completed Tuesday on a water main that flooded an alley and left some homes without water when it ruptured in Mission Beach Monday evening. Utility crews were sent to an alley off the 800 block of Seagirt Court near Mission Boulevard after water was seen shooting up into the air at around 6 p.m. Monday. A broken 12-inch-diameter PVC water pipe was the cause of the flooding, according to Arian Collins of the city's Public Utilities Department. Neighbors said they noticed water bubbling up from the ground before the geyser exploded up and shot into the air for hours, creating a muddy mess. 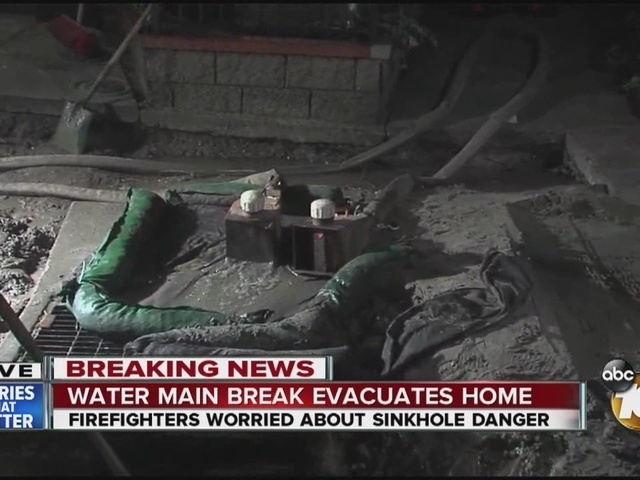 One home, an alley and some nearby parking garages were flooded and the flowing water caused a small sinkhole in the roadway. 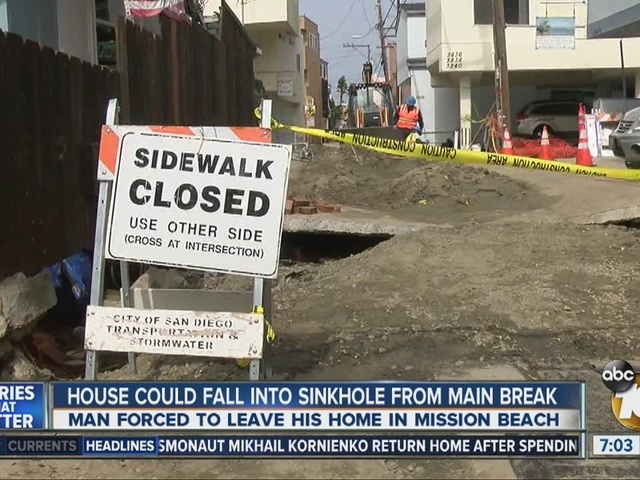 San Diego Public Utilities officials were concerned that a sinkhole could also form underneath the home as well. San Diego Fire-Rescue crews evacuated the man from the home. He says two of his cats are missing. "There's one of my bikes, floating," the man told 10News. "Everything is kind of sinking and the house is not lining up." Crews drained all the water from the flooded area and made the necessary repairs early Tuesday afternoon. An inspector was expected to examine the foundation of the home and determine if it was safe. 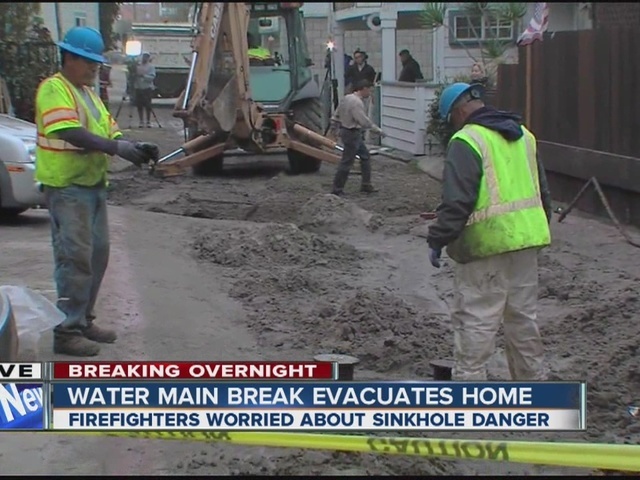 In 2015, the city of San Diego had 65 water main breaks. In 2014, there were 75; there were 130 in 2010. 10News learned 200 miles of old cast-iron pipes have been replaced with plastic lines. The city still has about 100 miles of cast-iron lines left.